These are my Raspberry French Macarons with raspberry jam filling, and dark chocolate ganache! I used these Raspberry Macarons to top my Raspberry Almond Chocolate Cupcakes. Macarons are one of my favorite things to bake. Today, I wanna talk about Almond Flour. 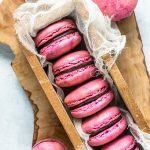 What kind of almond flour should I use to bake macarons? 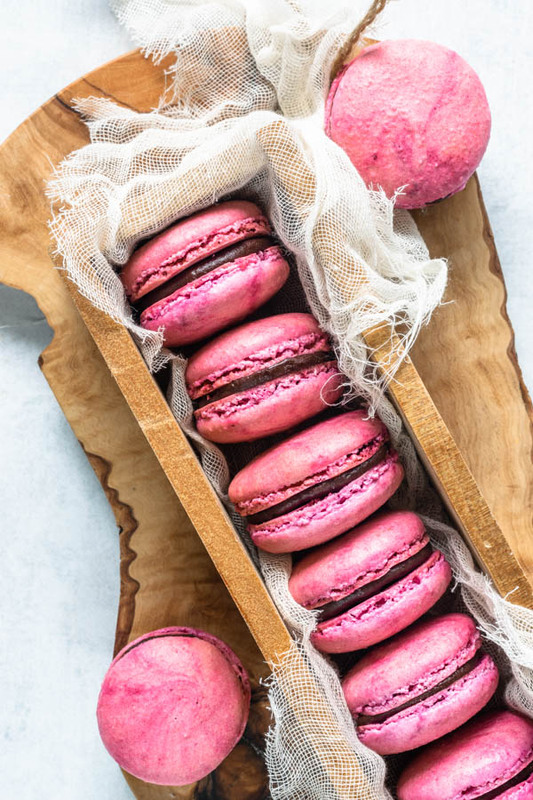 What brand of almond flour is best to use to make macarons? How many times should I sift the flour when making macarons? All of those questions have been raised in my kitchen at some point. And through some trial and error I was able to narrow down some answers. Now, listen, like I always say. Something that works for me and my kitchen, might not work for your kitchen and your style. Becoming a great baker is all about experimenting, and failing tremendously, while building your skills. Slowly, with passion, dedication, and most importantly patience. Trust me, I have failed at making macarons innumerous times, guys! And I have succeeded a lot of times, as well! Which always feels so rewarding! Answer: Blanched almond flour, so the batter is clear and smooth. Answer: Currently, for the method I use and the proportion of ingredients, it’s Bob’s Red Mill Flour. When I used to bake using the French Method and a different recipe than this one, I used King Arthur Flour with excellent results. Answer: So in the beginning, I read somewhere that I had to process my almond flour and powdered sugar in the food processor, and then sift it 4 times. It was madness, took me an extra 30 minutes to make macarons! Nowadays, I sift my flour and powdered sugar only once, and don’t use the food processor at all. Also, Bob’s Red Mill blanched super-fine almond flour actually is very super-fine! Ps. I am not being endorsed by Bob’s Red Mill, this is just my honest opinion. Remember these are just tips that work for me. And the almond flour is only one component of the recipe. A lot of elements have to come together to achieve successful macarons. I recommend you read as much online as you can about making macarons, watch youtube videos, read books about macarons, and you will eventually master them. And experiment with different brands of flour to find the one you like the best. 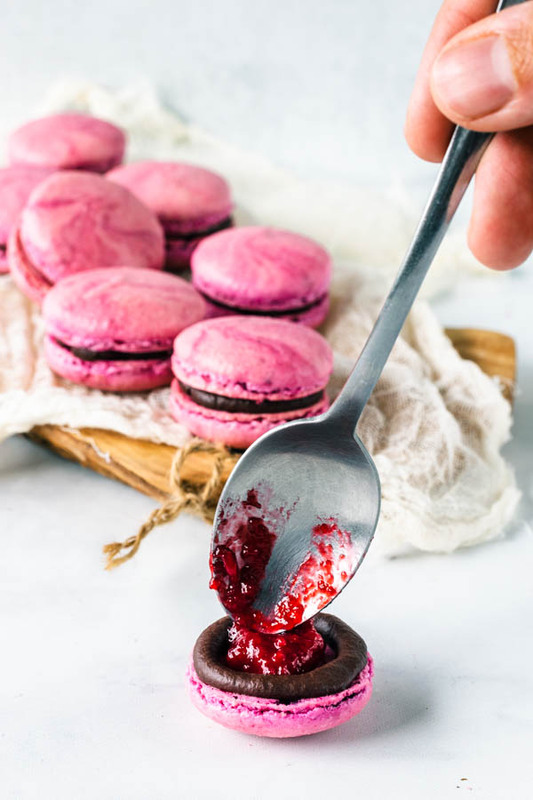 For the filling, you will need to pipe that ring of Dark Chocolate Ganache on the bottom of a Raspberry Macaron, and then fill it with about 1/2 teaspoon of raspberry jam. To pipe the ganache, I used a number 7 round Wilton piping tip, that came in this Wilton Master Decorating Tip Set , which is the most basic and useful Piping tip kit, if you don’t have one already. 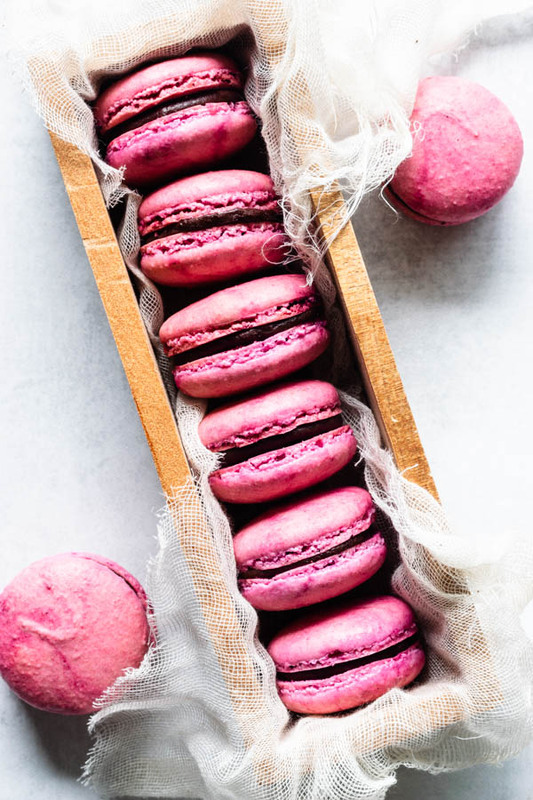 I hope you guys liked my Raspberry Macarons and my tips of what kind of almond flour to use for making French macarons! Thanks for reading, have a beautiful day, whoever you are, wherever you are! You’re probably someone wonderful and awesome, cause that’s the kind of people that like to bake macarons! Raspberry French Macarons with raspberry jam filling, and dark chocolate ganache. Before you start, get all of your ingredients ready. Prepare a large piping bag, fitted with a large round tip. Line two baking sheets with parchment paper or silicon mat. Under my parchment, I put a layout with circles that measure about 1 1/2 inches each. That’s how big I like to pipe my macarons. Measure out all of your ingredients. Sift powdered sugar and almond flour together. Set aside. Now you can finally start. Place egg whites and granulated sugar in a heat proof bowl or in a double boiler. Over a pan of simmering water, whisk the whites and sugar until frothy and sugar completely melted. It will take a couple minutes. You can test by touching the mixture between your fingers, and if you feel any sugar granules just keep whisking mixture over the water bath. Make sure the bottom of the bowl isn’t touching the simmering water. With the whisk attachment, whisk mixture on high speed for a few minutes until stiff peaks are formed. Best way to check this is to keep your eye on the whites. Once they get glossy and you start seeing streaks formed by the whisk, it might be time to stop. You don’t want to overbeat the mixture at this point, because you don’t want to add too much air to it. Just whisk until stiff peaks have formed. Pour powdered sugar and almond flour into stiff whites. Start folding gently forming a letter J with a spatula. Add the food coloring at this point. It’s time to stop folding when the batter is glossy and has a thick and flowing consistency. There are several ways to test this, and you might have to have a couple failed batches before you get this right. First, I pick up some batter with my spatula and try to draw a figure 8 with the batter that is dripping off the spatula. If you can form several 8 figures without the batter breaking up, that’s one indication that it might be ready. Then, I grab a teaspoon of batter and spoon onto my parchment paper or silicon mat. If the batter stays stiff and doesn’t spread out a bit, I start folding a little bit more, about 3 folds. Once the batter spreads out a bit and starts to look glossy on the parchment paper, I transfer my mixture to the piping bag. You don’t want your batter to be too runny either. So be careful not to overmix. It’s always best to undermix and test several times until the proper consistency has been achieved. This is the most important part about making macarons in my opinion. Once you’ve piped as many 1 1/2” circles as you could, bang the trays against the counter a few times each. This will release air bubbles that are in the batter and prevent your macaron shells from cracking. Let your trays sit for a while so the shells will dry out a little bit. I usually leave about 20-40 minutes, depending on how humid the day is. You’ll know they’re ready when you gently touch the surface of a macaron and it seems dry. Pre-heat the oven to 325F. Bake one tray at a time. Bake for 4 minutes, rotate tray. Bake for 4 more minutes, check if it needs to be rotated again. You will know if it needs to be rotated again depending on how the macarons are baking. Take a look at them, if one side seems taller then the other, maybe you have to rotate the tray again. Bake for around 2-4 more minutes. Really keep an eye out, not to overbake. 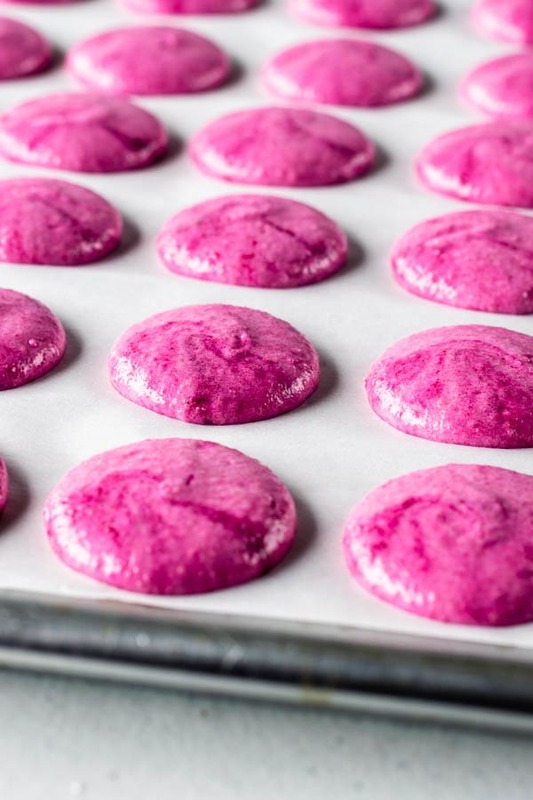 When baked, the macarons will have a deeper color and formed feet. Remove from the oven and bake the other tray. Let the macarons cool down before proceeding with the filling. Mix raspberries, maple syrup (or sweetener) and lemon juice in a small pot. Bring to a boil over medium heat, cook, stirring, for about 5 minutes. Use the spoon to break up the raspberries as you stir. Mix cornstarch and cold water in a small bowl. Once raspberries have boiled and reduced a bit, add cornstarch and water to the pan. Bring back to a boil, stirring constantly, until mixture is thickened. Pour through a strainer, and keep on stirring the mixture to strain the jam. Make sure to press it through really well so you can get the most out of it, and just leave the seeds behind. If you like the seeds, just skip the straining. I never skip it. Let jam cool. Cover it with plastic wrap and place it in the fridge. Chop dark chocolate very finely. Place it in a bowl. Heat heavy cream in a small pan over medium heat, or in the microwave. No matter what method you choose, be very careful not to boil the heavy cream. Pour hot cream over chopped chocolate. Let it stand for a minute. Start stirring with a spatula until completely melted. Let it come to room temperature. Refrigerate for a bit before using, until it has piping consistency. To achieve the piping consistency for the ganache, you will have to rely a lot on the temperature of the ganache. If it has been in the fridge for a while, and it’s too thick and hard to pipe, insert it in the microwave for a few quick seconds, and stir it again. Test for consistency and keep going until you achieve the desired consistency. To be pipeable, the ganache should be thick, but easy to spread. If it happens that the ganache is too thin, you might want to put it in the fridge for a few minutes so it will harden up. Like I said before, you need to keep testing for the consistency. Line a piping bag with a round tip, wilton number 7. Fill it with the chocolate ganache. 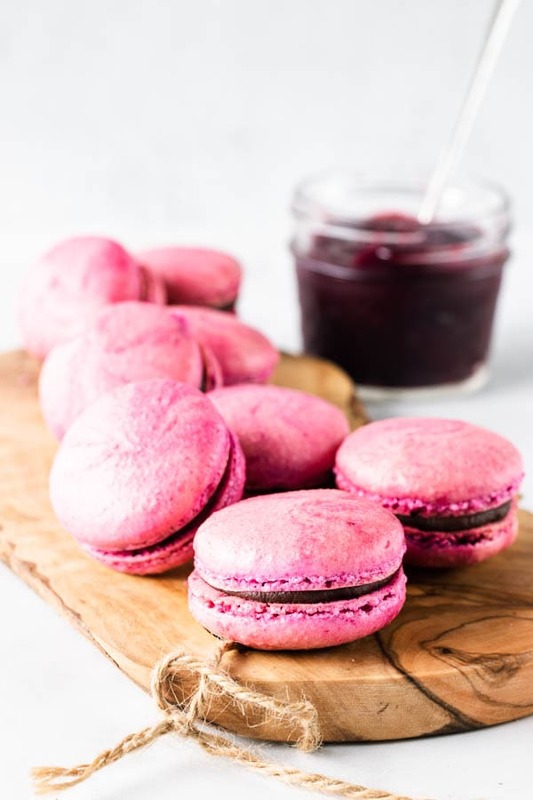 Once the macarons have cooled down, simply pipe a ring around the edge of a bottom macaron, fill it up with about 1/2 teaspoon of raspberry jam. Top with another macaron cookie. Macarons are best after they’ve matured in the fridge for a day, or at least a few hours. Since these macarons have a raspberry jam filling, which is a very wet filling, they won’t keep as well in the fridge for so many days, and I don’t recommend freezing them. You might get away with freezing it, if your jam is very very thick. 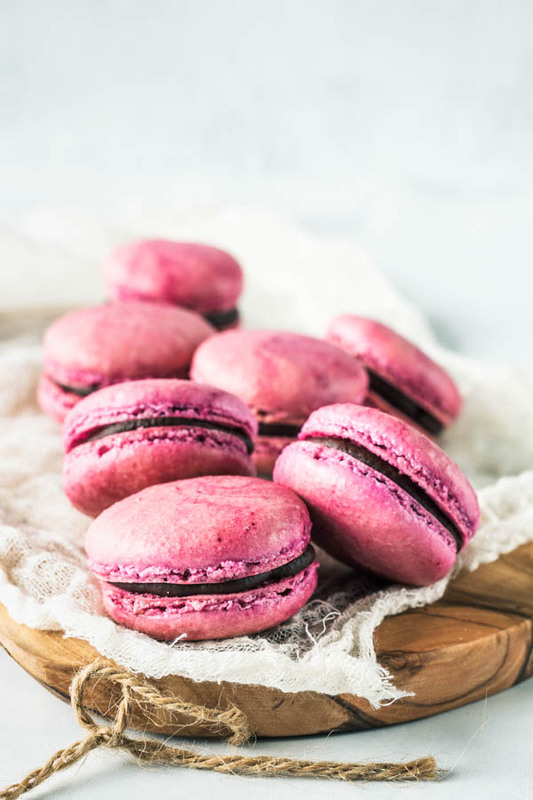 I would recommend refrigerating these Raspberry Macarons for up to 3 days, and if you do freeze it, I would recommend doing so for up to 1 month. If you don't want to make your own jam, that's ok. You can use store-bought. You will need about 1/4 cup of jam. You might have leftover ganache. If that's the case, you can keep the ganache in the fridge for up to 1 week and use in another recipe or to drizzle over ice cream and what not. Some people even say they freeze their ganache for up to 1 month, which I've never done, but I've seen that tip in several places. If you have leftover jam, keep it in the refrigerator and use it within 1-2 weeks. Spread it on some toast, or my favorite way is to add to a plain greek yogurt bowl, with some fresh fruit (and granola sometimes). Thank you so much, Alia!! Thank you so much, Makos!! Camila, você é muito caprichosa e usa de uma delicadeza incrível em suas receitas. Parabéns! What if I want to add dried raspberries (dried, ground) in the macaron and not in the filling? If I add a few tsp of ground raspberries do you think that will severely alter the consistency? Thanks! I have never experimented with that, so I can’t say if it would work or not. If I were to make an attempt, I would reduce the same amount of almond flour that I added of the ground raspberries, and I would not add that much raspberries either, probably not more than a tablespoon. But, like I said, I have no idea if that would work or not. You did get me very curious to know what would happen. If you do experiment I would love to hear your results. Thank you for writing! !